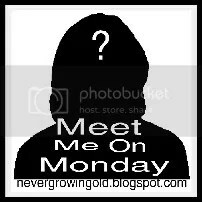 Welcome to the 62nd edition of “Meet Me On Monday!” Blogging is a funny thing…we tell our most intimate thoughts for all to read and yet most of the time I find myself sitting and wondering, “who is this person! ?” I know them…but yet I don’t know them! I want to know who the person is behind all those words so I thought of a great way for all of us to “meet” each other! 3. When do you put your tree up? 4. When do you take your tree down? 6. Do you have a nativity scene? 9. Where will you eat Christmas dinner? 10. Angel, bow or star on top of your tree? 11. Most annoying thing about this time of the year? 12. Do you like Fruitcake? 13. What are you most excited about the holidays? 14. Do you open presents Christmas Eve or Christmas Morning? 15. Will you still be wrapping presents on Christmas Eve? Both! Depends what it is, how big it is etc. Odd shaped things just go better in bags. Artificial. I was married to a fire fighter both times I was married. I had a real one until the year my son was born, then after seeing a video on how fast a tree goes up and how fast the fire multiplied I wasn’t comfortable having real with a baby in the house. After that pre-lit trees hit the market and the fact that I like to put it up the day after Thanksgiving (if not way sooner) artificial became the way to go. Now, here in the Diva Den with mom, my sister and nieces, we have a huge house so we have 2 trees, one in the living room and one in the family room. Either the day after Thanksgiving or sometime the week before. I love Christmas and cannot get enough of it. This year, because we had a holiday open house with our Avon business and that stuff is out early, it was actually up 2 days before Halloween. 🙂 A record for us! Usually the week after New Year’s Eve. Personally I’d leave it up all year, call it a ‘holiday tree’ and decorate it for each holiday throughout the year. Haven’t had a lot of support around here on that idea. Oh yes! Leaded (spiked) or unleaded. This time of year the local UDF (United Dairy Farmers) and McDonalds have eggnog shakes, a holiday favorite of mine! Yes we do! Growing up was one my dad made, then my kids bought me one for Christmas one year (I got it early) and I still have it. Hands down my favorite is “It’s A Wonderful Life”. Makes me always stop to count my blessings and appreciate the things I have and the things that have happened in my life. Only the black & white version will do, and it is tradition to watch it on Christmas Eve. Especially this Christmas, as we are very tight on money and there won’t be much under the tree, we’re focused around here on the fact that all 5 of us are home for the holidays and thankful for our family and friends, things money cannot buy that are truly priceless. OH Christmas trees made from a Mirro cookie press (the OLD ones that are hand cranked). The recipe is inside the box and it is the best cookie ever! My son can knock out several dozen in one sitting and that is his favorite as well. Right here with my parents, sister and her girls and our future (though to us she already is) sister-in-law and hopefully her daughter. My son is on duty, so is one of my brothers (cops and firefighters) but hopefully my other brother and my daughter will drift in. Anyone is welcome to come share the day with us, it is a time for sharing love and we have plenty to go around! Well it would be an angel but she isn’t being cooperative and staying put (not that the 3 felines scaling the tree might have anything to do with that) so it’s a bow on both trees. 11. Most annoying thing about this time of year? The commercials and attitude of people in stores. This isn’t about gifts, and even if you don’t celebrate the birth of Christ, it is a time of year to spread joy and love. I hate the commercials with people giving cars and diamonds etc. Give me an old fashioned Christmas like on Little House On The Prairie where one gift was it and it was something significant in meaning. Actually yes I do, SOME of them anyway. There are some that are well not so much but others are yummy with a cup of coffee. Just being together, the decorations, the time to reflect on the blessings that are the true gifts we receive each year, and be with my family. Both! We have a huge family gathering on my mom’s side where it is on Christmas Eve, though no gifts this year for the first time in my 48 years. And then as more immediate family in the morning. 15. Will you still be wrapping presents Christmas Eve? It wouldn’t be the first time if I was, but this year no it will all be done ahead of time. Hi Marvi. You have such a beautiful heart and exemplify the true meaning of Christmas. I’m so happy I visited your page. The Christmas spirit is alive and well!